The Tarot Card for November is Temperance. Temperance is also referred to as Art or Equilibrium. 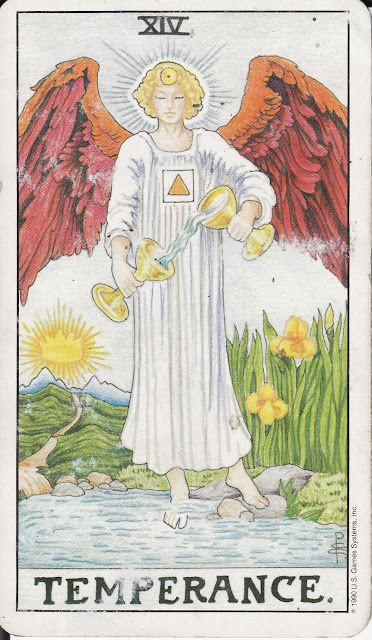 Temperance is the Fourteenth of the Major Arcana in Tarot. Temperance is associated with the planet Jupiter, the element of fire, and the zodiacal sign of Sagittarius. Temperance represents balance, moderation, patience, and peace. Temperance reminds us that harmony comes from the union of dualities. In Freemasonry, Temperance is a cardinal virtue and defined as "that due restraint upon our affections and passions which renders the body tame and governable, and frees the mind from the allurements of vice." One must exercise caution in his action, speech, thought, feeling, judgment, and life. Temperance is depicted by a winged angel, considered both male and female, pouring water from a cup in her left hand to a cup in her right. The angel is wearing a white robe with a golden triangle within a square. The angel has one foot on the ground and one in the water. On one side of the angel are golden lilies and on the other shows a mountain with a setting sun. The angel upon the earth represents one's interaction with both the material and the divine. The androgynous nature of the angel represents balance between the sexes. The pouring of water between cups represents the act of finding the right balance between two sides. The golden triangle is said to be an ancient symbol of healing. It is also interesting to see the alchemical symbol of fire contained within the square, another emblem to represent the earth. Combined they represent the sacred flame, the soul of man, contained within the body; Temperance is a reference to the soul. The foot in the water represents the subconscious and the foot on the ground represents the material world. The mountains in the distance represent a future journey to be taken that will bring spiritual fulfillment.